Enveloped in a period of remarkable achievement, the biopharmaceutical company Cephalon hit growth-induced challenges. While we worked with Cephalon previously to develop the company’s brand story, Cephalon now needed to dedicate specific attention to a critical internal team — The Research and Development (R&D) department. R&D was at the heart of the company’s innovative core. As the department continued to grow, the R&D leadership team needed to take action to strengthen the foundation of the department and prevent unbridled growth from pulling them apart. To surmount the challenges, the 22-member R&D leadership team convened, capturing a united foundation of values – leadership promises to which employees could hold leaders accountable. 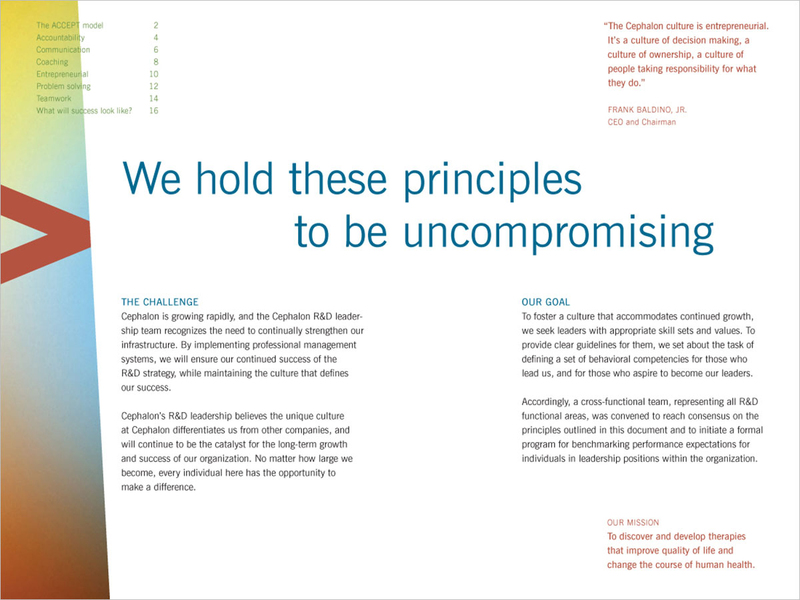 Cephalon’s leadership asked us to extend what began as an acronym into a more complete story — “ACCEPT. No less.” — in alignment with the greater corporate brand story. We worked closely with the team to create personal touch points, capturing departmental promises and advancing the insatiable spirit of the organization. This initiative helped strengthen the cultural glue within the R&D department, unlocking future growth — both within the department and the greater company.